I live in Georgia so what do I know about snowboarding? However, as Eldredge intended it, it is a great metaphor for life and for leadership. It is so easy to look back to the mistakes and missed opportunities of the past that we move forward with fear. Is that really how we are supposed to live life? Life is meant to be lived full bore. We need to look forward and lean into it. (Tweet this) Sure it is risky, but the rewards are so much greater. I forgot where I heard it, but I read where someone described life as soaking wet sponge. They said their goal everyday to wring out every last drop of life. They want it all. This is not intended to come across as self serving, but to encourage us all to lean forward into life. Whenever possible help someone else lean into their life. 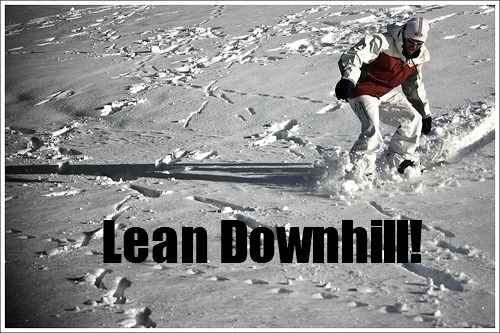 What keeps you from leaning forward?